Director: Martin Scorsese. Cast: Griffin Dunne, Rosanna Arquette, Linda Fiorentino, Will Patton, Teri Garr, John Heard, Cheech Marin, Tommy Chong, Catherine O'Hara, Verna Bloom, Robert Plunkett, Bronson Pinchot, Larry Block, Clarke Evans, Victor Bumbalo, Will Patton, Victor Argo, Murray Moston, Clarence Felder, Stephen Lim, Robin Johnson. Screenplay: Joseph Minion. Twitter Capsule: Visual, behavioral quirks keep scenes humming, but film turns dry, desperate. Flat soda. Martin Scorsese's After Hours, clearly styled as the sort of recreational diversion that Steven Soderbergh typically tosses off between tentpole projects, proves an instructive watch after Neil Jordan's Mona Lisa, a fellow entrant in the 1986 Cannes Film Festival. Jordan's film manages to maintain an odd, unpredictable narrative structure while still zeroing in on a tense climax and dénouement; it also takes advantage of a few well-distributed flourishes of rapid camera movement, forceful editing, or ostentatious camera angles to endow the film with sudden energy or resonance. By comparison, After Hours stocks itself full of needlessly showy tracks, cranes, and zooms that only serve to plump up a movie whose offhanded modesty is its most promising quality. Scorsese's talent is obviously beyond dispute, but his tendency toward hollow showboating has rarely been more in evidencea problem, too, in his follow-up movie The Color of Money, though at least that one capitalizes on the dichotomy between cockiness and subtle suavity as a thematic force. The best scenes in After Hours are almost always simple, as in the opening exchange between patient but bored white-collar worker Paul Hackett (as in, Can't Hackett) and a colleague played by Bronson Pinchot, who flails with Paul's instructions for the new company software but snidely considers himself above the whole thing, anyway. Paul retreats from this deadening day at work to a nearby diner, where a Manhattan pixie named Marcy Franklin (Rosanna Arquette) spots him reading one of her favorite Henry Miller novels and seems to ask him out on a date, or at least to encourage him strongly to ask her on a date, though she leaves before he's fully worked up the nerve. Scorsese, his actors, and their behind-the-camera colleagues generate terrific atmosphere in this scene, one of immediate and frankly sexual interest that's neither overstated nor overconfident. Schoonmaker's frequent weakness for mismatched takes and angles gives the exchange an appropriately rough texture of crossed wires or uncertain reality, even as Paul and Marcy seem like fully plausible denizens of the Big Apple and eager to get to know each other, as we are eager to get to know them. We feel clearly that we're in a comedy even though nothing particularly funny is happening, and that smart, muted, observational style of leading man Griffin Dunne is a real asset, implying that After Hours might mark a return to the kind of colorful behavior study that Scorsese rendered so fondly in Alice Doesn't Live Here Anymore, at least before things start falling apart in that movie's final act. After Hours, sadly, doesn't take nearly as long to start scuttling its potential. It may well be exactly the movie that Scorsese, producer-star Dunne, and young phenom screenwriter Joseph Minion (later charged with plagiarizing much of the script) set out to make, and the movie has never fallen out of favor with a subset of Scorsese fans who prefer his work in this offbeat vein to the grotty operatics of Taxi Driver and Raging Bull or the bloated pageantries of The Aviator and Gangs of New York. I can understand the desire for a film like After Hours to showcase a different, less grandiose side of the filmmaker, especially after such a strong start, but once Paul calls Marcy to arrange a date later on the same night, the film's chosen idiom of hipsterish, purgatorial farce proves hard to sustain without blowing it up or dumbing it down. The last scenes of real interest transpire in the apartment that Marcy shares with her sculptress roommate Kiki Bridges (a barely clothed Linda Fiorentino), who is strangely the only person home when Paul arrives. The Paul-Kiki interaction feels comically forced and entirely predictable, particularly a punchline about falling asleep during foreplay. Still, an eerie atmosphere of mystery, partly sinister and partly sympathetic, begins to accrue around Marcy's inexplicable comings and goings and her abrupt fluctuations between shyness and aggression. Dunne plays his befuddlement well, and the funniest moments in the film are also among the most unsettling, as Paul can't help poking into Marcy's secrets and feeling distracted by her imperfections, even if he's only imagining them; After Hours shows us just how careless and presumptuous we can sometimes be in relation to people we've barely met and are trying to attract. Before we know it, Paul decides that Marcy and Kiki are conspiring to humiliate them, but it's hard to tell whether or not he's overreacting, partly because the movie stops making clear calls between evoking the women's intimacy as a neurotically projected threat and taking their cynicism entirely for granted without bothering to bring the episode to a credible, clear conclusion. Quite obviously, After Hours desires a perplexing admixture of ambiguities, but the curtailed end of this sequence feels more hasty and slapstick than cleverly unresolved. 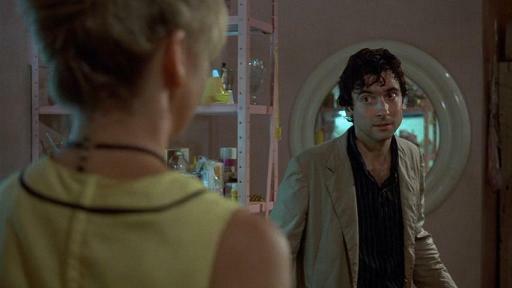 After Hours seems to have won Scorsese a Best Director prize at Cannes largely on the principle of his strongly flaunted hand, forcing the film along and making obnoxiously clear how "directed" it truly is. Still, whatever my own frustrations with the movie, it has certainly proved influential and serves as an intriguing frame of comparison for so many other Scorsese films, whether more somber in tone or more electrically pulpy. Opinions and critical emphases fall all over the map, so it's worth checking in and forming an opinion, even if I'm astonished at how little "there" is there.